Florence, Italy is a city you can visit again and again. Food, art, fashion, history - it can all be found here. If it’s your first time visiting, you’ll likely want to see David at the Accademia, perhaps spend a few hours admiring the incredible Uffizi art collection, take in the grand Duomo, and enjoy the sights, smells and tastes of the Central Market. Yet, there’s so much more to Florence. We signed up for Azamara’s “Independent Exploration of Florence” Azamara Shore Excursions tour, which provided an easy way into the city and some excellent history and information along the way. We began our day by crossing the Arno River to visit Piazzale Michelangelo. This square, built in 1869 on a hill just South of the historic city center, offers the most breathtaking panorama of Florence possible. 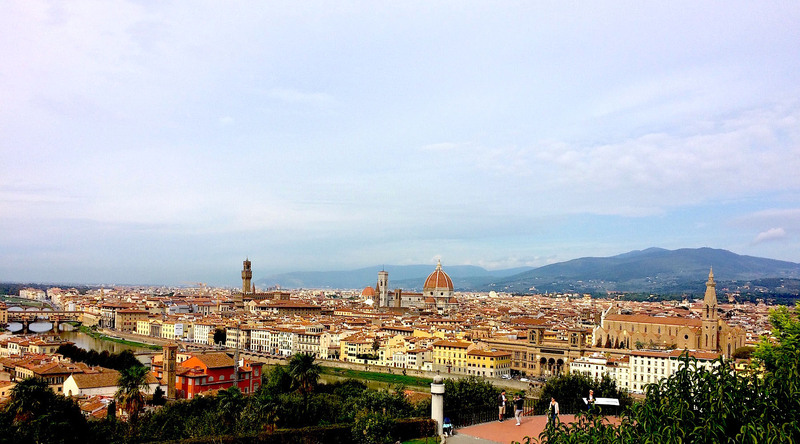 It’s a view that will make you fall in love with Florence. We visited the nearby Basilica San Miniato al Monte nearby, and explored its vast cemetery, where many famous Italians are buried – including Carlo Collodi, the creator of Pinocchio. The Piazzale is at the top of 680,193 steps (OK, I did not count - but it felt like it!) so it’s not a climb for the faint of heart. If you go, take my advice: treat yourself to a gelato afterwards. Afterwards, we explored the city center of Italy, stopping for a glance of the Duomo and Piazza della Signoria. We used the Azamara & AFAR Media app to get great recommendations for the area, and ended up at a sidewalk café for a glass of Brunello wine and boar salami (cinghiale) sandwiches. In the afternoon, we found our way to our chosen Hide & Tweet location: the Basilica di Santa Croce Leather School. Kristi, on Twitter, was the first person to correctly identify where we were. She’ll receive a wonderful book about Florence art & architecture! The Basilica di Santa Croce is the largest Franciscan church in the world. Legend says the church was founded by Saint Francis himself. Today, the dormitories house the Scuola del Cuoio, or Leather School. It’s fascinating to watch the artisans craft a variety of leather goods, and the adjacent store is one of the best places to buy leather goods in all of Florence. In fact, Florence is a shopaholic’s dream come true. The famous Ponte Vecchio is only a fifteen minute walk from Piazza di Santa Croce, and is home to jewelers, souvenir shops and art dealers. It may be touristy, but it’s worth a look. Continuing on from there, it’s a ten minute walk to the Santa Maria Novella Church. This church isn’t among the most impressive in Florence, but is home to one of the world’s oldest pharmacies. Officina Profumo Farmaceutica Santa Maria Novella now sells perfumes and colognes, soaps, and other products. For those who’d prefer to look, but not buy, the Gucci Museum near the Uffizi Gallery is an enjoyable place to visit. After a full day of exploration, we returned to the Azamara Quest, eager to reconnect with Simon and hear about his day in Florence and Pisa. Follow along tomorrow, as we Hide & Tweet in the eternal city: Rome! Florence is a stop on the glamorous 5 Night Monaco Grand Prix Voyage next May. #CruiseChat is coming to Europe with Azamara Club Cruises!